With Halloween coming up, and all the sweets being eaten at this time of the year, it can be nice to try some rather natural alternatives. This is so easy that it’s ridiculous. 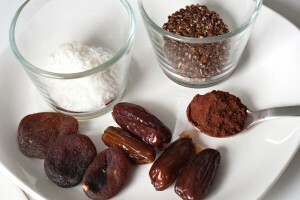 You’ll need dried fruit, some seeds and cacao. It takes less then 15 minutes and can easily be done by kids as well. Mix all together in the mixer – transfer to a bowl and add a spoon or two of (cold) coffee until it becomes a sticky dough. Roll dough into small balls with your hands and then roll them in shredded coconut and put on a plate. Now for someone like my cousin (hi Anna!) who does not like coconut, you can of course add more flax seeds instead of the shredded coconut, or try nuts or other seeds. 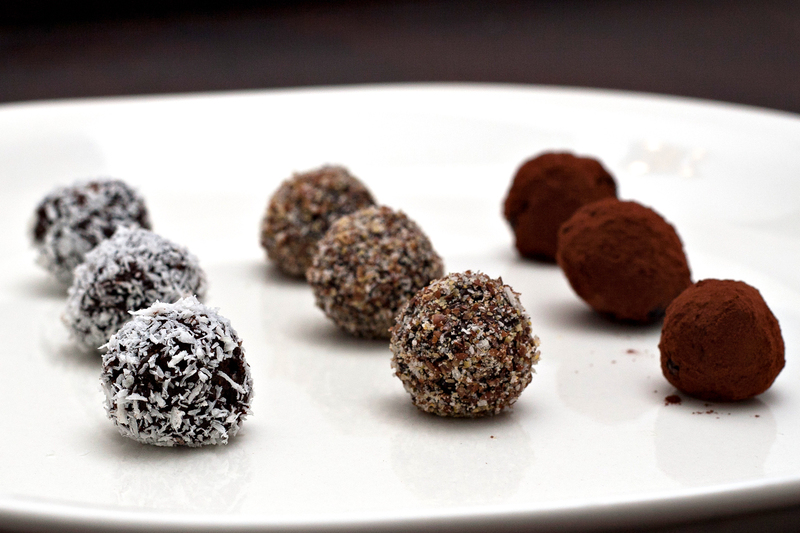 And instead of rolling them in shredded coconut, roll them in flax seed flour (just mix the flax seed into a powder) or in plain cacao – Actually, it looks really lovely to put all three, together on a plate.